Biz Technology Solutions, Inc. is Counting on You, our Valued Customer! We would like to personally thank you for providing Biz Technology Solutions, Inc. the opportunity to service your business through the years. We gratefully acknowledge your trust and support. To show our appreciation, we’re introducing a new Customer Referral Incentive Program! Refer your colleagues in your industry to Biz Technology Solutions, Inc. and tell them about our quality customer service and innovative solutions. 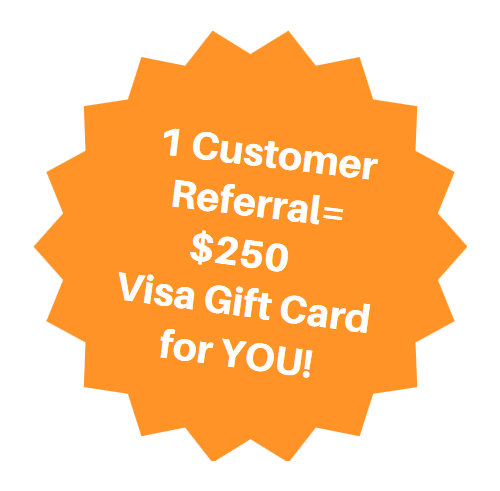 Pass our company contact information along to another potential customer and if Biz Technology Solutions, Inc. completes a service for that customer, we will send you a $250 VISA gift card! The Visa Gift Card will be sent to the referring party within 30 days after the first receipt of payment from the referred company, subject to availability. Referrals expire 180 days after submission. In order to qualify for a referral bonus, the referred company (1) must not already be a BizTech client; (2) must not have engaged in sales conversations with our sales team during the past 6 months; and (3) must not have been recently referred by another company. You can submit your referral using the referral submission form below. Please fill out the entire form. If Biz Technology Solutions, Inc. is your preferred IT Support and Technology Provider, spread the word!